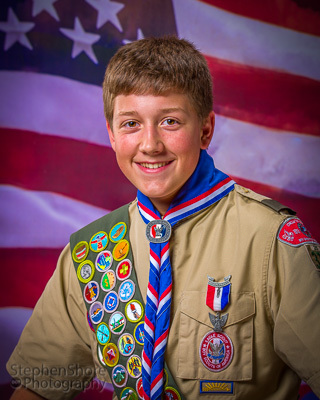 ... that's the motto for having a great portrait as well as for the Boy Scouts in general. Your parents are hugely proud of you for earning year Eagle. They may have this portrait up on the wall of their home for the rest of their lives. How do you want them to see you in 25 years? And you may be showing this portrait to your own son in a few years. What image do you want to present to him? We are not telling you how you should look, only that you should think about how YOU want you to look. So, do a few things before arriving for your portrait to make sure that you look great. Wash and press your Scout shirt. While you may have grown fond of that hole that was burned into it at a past campfire or the BBQ sauce stain from an awards dinner, looking at it in your portrait over the years will only end up embarrassing you. Wear either a v-neck t-shirt or no t-shirt under your uniform shirt. The neck of a crew neck t-shirt will show above the neckerchief and will not be as clean a look. Shave your beard the morning of your portrait. While today you may look good with a three-day growth, is this the image of you that you want your parents to see for the next 30 years? A Scout is Clean. Have clean hair. Make sure that your Eagle patch is sewn on your uniform. 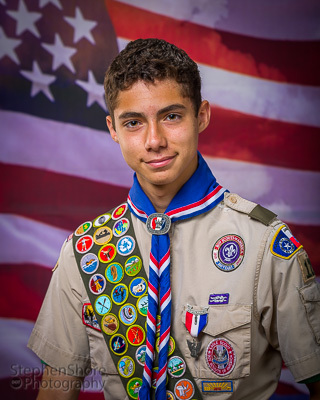 As soon as the council receives the confirmation of you earning your Eagle rank from National, typically a couple of weeks after your EBOR, you are entitled to wear an Eagle patch. You do not have to wait for your ECOH to start wearing the Eagle patch. I do not have an Eagle patch. However, I can add an Eagle patch in post production of the image. There is a $25 charge for this editing service. Eagle Medal – Wearing the Eagle Medal in addition to the Eagle patch is completely optional. 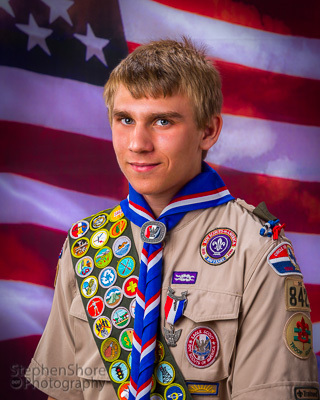 The majority of Eagle Scouts coming in for a portrait do NOT wear their Eagle medal. It is completely personal preference. Also, there is no BSA guideline on placement of the Eagle medal on the uniform. However, it tends to look best for the portrait if it is attached to the right side of the left pocket so as to not cover the patch. There is an example photo of medal and patch placement to the right. If wearing a religious medal, it looks best on the opposite side of the same pocket the Eagle medal is on. Please make sure that all medals and patches are attached to your shirt before you arrive for you session. Make sure all achievement badges are attached before you arrive at the studio. Bring your Merit Badge sash, neckerchief, & Medals. 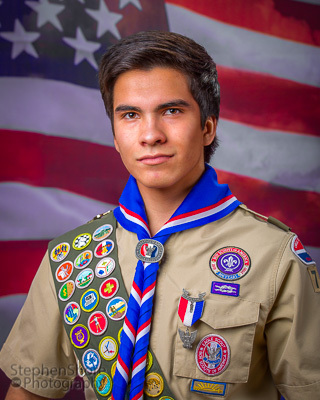 (We have an Eagle neckerchief and slide that you can use if you haven't yet received your own.) We will be using a neckercheif slide that I have modified, so you will not need one. If fact, using our pre-rolled neckerchief and modified slide is by far the easiest and fast way to go. And, in case you are interested, we have investigated the proper ways to where a neckerchief. See Do you wear your neckerchief over or under the collar? Do NOT bring your Order of the Arrow sash. 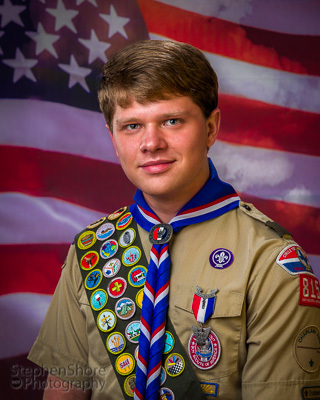 The BSA Guide to Awards and Insignia specifically says that the OA sashes "are never worn on the belt or with the merit badge sash." Plan on turning your shirt collar under and not buttoning your top button. You'll look better without your collar points peeking out beneath the Eagle neckerchief. Bring a comb or brush. You'll want to adjust your hair just before your session. Do NOT bring a cell phone into the camera room. I don't waste your time by answering a phone during your portrait session. Phones are just distracting and end up causing results not nearly as good as when we both concentrate on the portrait. This goes for both Scouts and their parents. Shave – It is worth saying a second time. You will be looking at this portrait for years to come. Don't end up asking yourself why you didn't bother to shave for decades when you can avoid this with less than 2 minutes of effort now. Can we retouch the portrait so that you look clean shaven. Sure. And we'll also be happy to charge you the $250 retouching fee to get rid of all those little hairs that you could have eliminated for about 4¢ worth of shaving cream. The image you prefer is chosen from among the 4 or 5 images taken at the time of the portrait session. We do not provide any post-session "proofs". Any of your family members who want to be involved in choosing a particular image for purchase should attend the portrait session. If you want to buy prints (not required) of your portrait, there are two types of packages available. Basic pagkages: No retouching is done to these images. They are printed on-site and you will be able to walk out the door with your prints. The largest size available for basic packages is 8x10". Premium packages: Post production work is done on these image cleaning up skin complexion, stray hairs, loose threads, uniform burn holes from previous campouts, etc. These will have a professional level that cannot be achieved without post production. These prints are available on resin paper, canvas, or metal and can be made almost any size. Framing is available for these packages. Typical delivery time is 2-3 weeks. Remember, a Scout is Trustworthy. We understand that situations change and you may have to change your appointment date. There is no problem with cancelling a session date and rescheduling on another date ... as long as you remember to cancel the appointment you can't make. Just go back to the session confirmation page and indicate that you will not be attending that date and then choose another. Or send a message through the "Contact Us" page of this site to notify us. 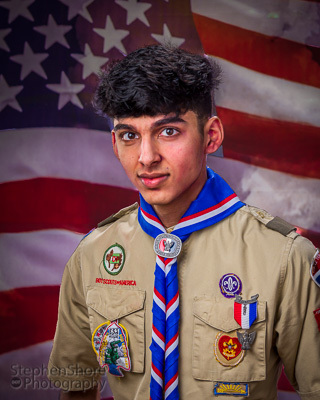 However, if you miss a session date without prior notice (at least 2 hours in advance), you will be charged our normal portrait session sitting fee when you do later come in for an Eagle Scout Portrait session.